"In 1814 Ferdinand VII posed for Francisco de Goya. There was nothing unusual in that. Goya, court painter for the Spanish Crown, was doing a portrait of the new monarch. But artist and king detested each other. The king suspected, and with good reason, that Goya's court paintings were disingenuously kind. The artist had no choice but to do the job that earned him his daily bread and provided an effective shield against the enmity of the Holy Inquisition. There was no lack of desire on God's tribunal to burn alive the creator of La Maja Desnuda and numerous other works that mocked the virtue of priests and the bravery of warriors. The king had power and the artist had nothing. It was to reestablish the Inquisition and the privileges of nobility that Ferdinand came to the throne borne on the shoulders of a crowd cheering: "Long live chains! Sooner rather than later, Goya lost his job as the king's painter and was replaced by Vicente Lopez, an obedient bureaucrat with a brush. The unemployed artist then took refuge in a country home on the banks of the Manzanares River, and on the walls he created the masterpieces known as the Black Paintings. 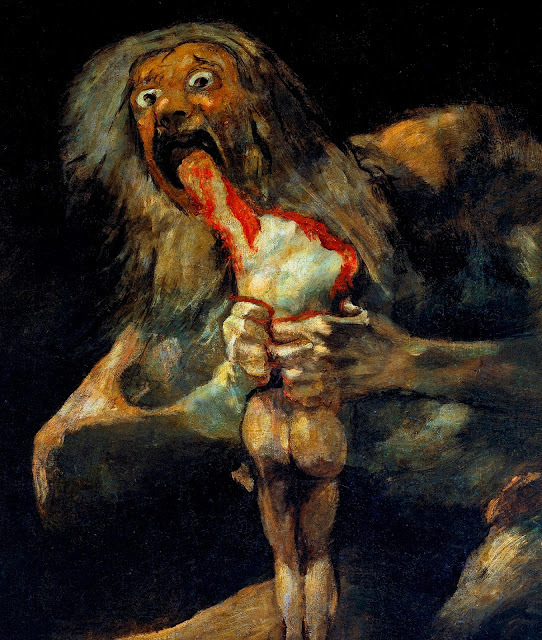 Goya painted them for himself, for his own pleasure or displeasure, in nights of solitude and despair. By the light of candles bristling on his hat, this utterly deaf man managed to hear the broken voices of his times and give them shape and color."